As the UK starts the Brexit process Oldham Council is expanding its involvement in EU funded selective utopianism as it partners once again with Europe’s poorest, Romania and Bulgaria, plus Flevoland in the Netherlands and Emilia-Romagna in Italy. Oldham council describes the scheme as a “Europe-wide project” when in actuality it is just the four areas listed above, these schemes do not have queues of Europe’s affluent economic regions nor the UK’s fighting to sign up. So what is the scheme this time? “Oldham Council is developing a recipe for success using innovation to create a sustainable local food chain.” Basically more poverty management for which the EU holds great responsibility for the ludicrous levels of unskilled benefit dependent Eastern European migrants dumped upon Oldham. 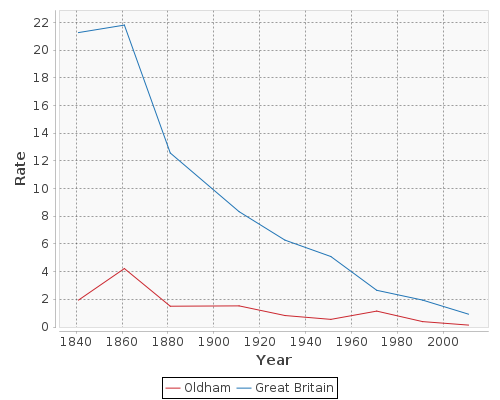 Safe to say these migrants don’t come to Oldham to fill labour shortages in our non-existent cotton manufacturing industry or pick the crops from Oldham’s less than sizable agricultural sector which has employed between 0.2% and 1.6% of the population for the last 140 years. “In simple terms, the project is about supporting innovation through community growing, cooking and marketing locally produced food, reducing food miles and redistributing surplus food. ” In simple terms it is more photo and award opportunities for Labour Oldham in central areas that accommodate 85% of Asian migrants, 70% of EU migrants and 59% of rest of the world migrants. More money to be spent in the central Oldham unsustainable communities with hundreds of non-contributory concealed families, where a third of migrants never work, nearly half of all Oldham benefits are claimed and birth rates are 25% higher than the so called “baby-boom” generation. You cannot build sustainable food-chains with “veg in the park” and half a dozen pots in alleyways when you have no control of population or culturally driven deprivation, there are a quarter of a million people in Oldham do get real. “And Cllr Abdul Jabbar, Deputy Leader of Oldham Council, who led on securing the funding, said: It’s a win-win and thanks to the external funding we have received, won’t cut in to our budget for core services.” The funding award is £150,000 to put that into context Oldham council have spent £65,000 in four months promoting coop policies, £520,540 on the town centre digital hub, £67,548 on electricity supply for the old town hall cinema in January & February 2017 and £2.5 million more on the old town hall development than the final quoted maximum cost. When we leave the EU Labour Oldham will blame the loss of multiple scheme funding on right-wing Brexiteers and Conservative austerity leaving out OMBC’s escalation of post-Brexit-vote funding applications and the huge social and financial cost the EU has inflicted on Oldham. Labour continue to advertise Oldham as the Greater Manchester poorhouse but it is one created and maintained by socialist policies and culture. How can this borough be part of any northern powerhouse when it can’t even get the basics right.